Want the best mass gain protein powder supplement to build muscle size in 2018? Here is an expert review of some of the best mass gain protein powders for building fast muscle mass in Australia today. These popular and leading mass gain protein powders and supplements are formulated for the protein and energy needs of: Footballers, Bodybuilders, Runners, Fitness models, Endurance and Strength Athletes. You may not realise it, but these athletes wanting fast mass gains have four very similar nutritional requirements when it comes to choosing a protein supplement. Our top 9 Best Mass Gain Protein Powders Review 2018 looks at overall nutritional info, formula, type and specification of active ingredients, and price. The ultimate goal of this review is to help Australian athletes make a well informed decision on the best Protein Powders for Mass Gain, formulated to build real muscle. 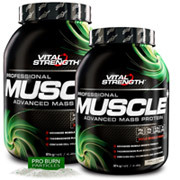 Is Vitalstrength Pro-Muscle Advanced Mass Protein Powder the Best Muscle Mass Protein Powder Supplement for Building Muscle? Pros: A true ‘high’ protein powder formulated for muscle mass gain and growth containing whey protein isolate, concentrate and calcium caseinate plus creatine. A quality carb profile and added fat burners including l-carnitine helping to build muscle size without unwanted fat. Cons: If you are looking for more carbs, this formula isn’t for you. Verdict: Packs a punch with the highest protein level in its class and a good blend of simple & complex carbs, plus recovery amino acids. It’s one of the only protein powders reviewed with added fat burn ingredients, making it one of Australia’s best value and leading muscle mass gain protein powders for building muscle. Expert Tip: Make sure you check the www.vitalstrength.com/sale page as they often have some great deals. 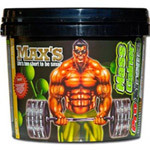 Is Max’s Mass Gainer Pro-Extreme the Best Mass Gain Protein Powder Supplement for Building Muscle? Pros: Contains a good balance of WPI, complex carbohydrates and fat, plus added recovery, muscle building and fat burn nutrients. Cons: Building muscle size needs protein, and this formula is a bit low at only 40%, plus it’s a bit pricey for what you get. Verdict: Contains the key ingredients to build muscle size fast but we would have preferred a higher protein content. Smart consumers will find a better value muscle mass protein powders for building muscle than this. 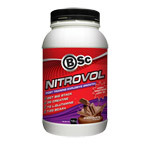 Is Bodyscience Nitrovol the Best Muscle Mass Protein Powder Supplement for Building Muscle? Pros: A WPC formula with a reasonable protein / carbohydrate ratio for a protein powder to build muscle mass. Contains some muscle growth and recovery nutrients including Creatine and L-Glutamine. Cons: Contains some lower grade proteins including milk solids and no WPI. Large serving size is appropriate for some athletes but it does mean less serves per pack. Verdict: Ticks most boxes but to be a leading protein powder to get muscle mass it but could do with more protein per serve. Is Musashi Sports Protein the Best Muscle Mass Protein Powder Supplement for Building Muscle? Pros: A fairly new protein powder to build muscle size. It contains Whey Protein Isolate and Calcium Caseintate plus added creatine and amino acids from a leading protein powder brand. Cons: The high quality protein is offset by a few lower grade proteins including milk solids, the high sugar content per 250ml serve (with water) is the same as 250ml of a popular cola drink (27.5g). Verdict: A sports protein powder that contains some good nutrients, however it needs to be higher in protein and lower in sugar to be the best protein powder for building muscle mass. Only available in a 1.25kg tub so offers limited value for serious trainers. 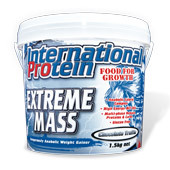 Is International Protein Extreme Mass the Best Muscle Mass Protein Powder Supplement for Building Muscle? Pros: Contains 5 protein sources including isolates, concentrates and caseinates plus 9g of added canola, sunflower and MCT oils. Low in sugars. Cons: The extra carbs have come at the expense of the building-muscle-size protein. With a balanced 50: 50 protein carb ratio, you may be getting the energy, but may be under nourishing your muscle growth potential. Large serving size is appropriate for some athletes but it does mean less serves per pack. Verdict: Good sugar profile for athletes’ sustained energy requirements. Needs a higher protein % to be the best protein powder for building muscle mass but some men may like the added oils as another source of calories. Is Balance Original Mass Gainer the Best Muscle Mass Protein Powder Supplement for Building Muscle? Pros: The 6 protein sources including WPI and WPC will provide a good amino acid profile, plus glutamine, vitamins and minerals for recovery. Particularly good for intense training athletes. Cons: High in sugars meaning the type of carbohydrate is not what many professional athletes are after. When there is more carbs than protein, a serious athlete should consider a serious grade formula. Verdict: This formula needs more protein and less sugar to be the best muscle mass protein powder for building muscle size. Is Horley’s Awesome Mass the Best Mass Gain Protein Powder Supplement for Building Muscle? Pros: Clearly formulated for guys wanting a high carb protein supplement to build muscle size. The muscle building ingredients include glutamine, creatine and MCT. Cons: WPC as main protein source plus lower grade skim milk solids means athletes wanting a protein powder to build muscle size are getting a comparably low protein dose. Verdict: Reasonably priced but the moderate protein level explains the cheaper price. We reserve verdict on this one, as it might be right for some, but not ideal as an advanced or professional grade muscle mass building protein powder. Is Cytosport Cyto Gainer the Best Muscle Mass Protein Powder Supplement for Building Muscle? Pros: Carbs are purely maltodextrin (complex carbohydrate) making it lower in sugar for sustained energy release. Added Creatine and Glutamine. Cons: WPC/Milk Protein blend. Low in protein. Only just qualifies to be a part of this protein powder review. The artificial flavours won’t be for everyone. Verdict: Claims to be a “high protein gainer powder” but in our opinion, when half the tub is carbs, its lacking the protein and amino acid credentials required by serious athletes to call it a protein supplement for building muscle size. Is Aussie Bodies Body Bulk the Best Muscle Mass Protein Powder Supplement for Building Muscle? Pros: A whey protein concentrate/isolate blend with added vitamins and minerals. Cons: Nearly all the carbs come from sugar which is not ideal for sustained energy release required for sports and strength training. Lower grade proteins including skim milk powder and no significant added nutrients to help build muscle mass fast. Verdict: Too much sugar!! A simple formulation that needs to be higher in protein to be the best max gain protein powder for building muscle mass. Offers very limited value for serious trainers as it is only available in a 750g container. There are stronger, more specialised muscle growth protein powders on the market that tick more boxes than this one. So there you have it! The results of this muscle mass gain protein powder supplement review 2017. We understand that everyone has different goals, budgets and priorities but we hope that this review will help you make an informed choice next time you are in store. Remember if you want to get big muscle results you need to eat big and train hard!! While you need some carbohydrate to restore energy post exercise, our review panel thought it was better for a mass gain athlete to buy a “high protein” mass gain muscle building protein powder that feeds your body with amino acids rather than choosing a cheap carb loaded formula. Therefore, only top mass gain muscle building protein powders, higher than 35% protein were considered. If you do need higher carbs, it is often better value to easily add these yourself to one of the top mass gain protein powders reviewed below. More interested in getting ripped and lean? 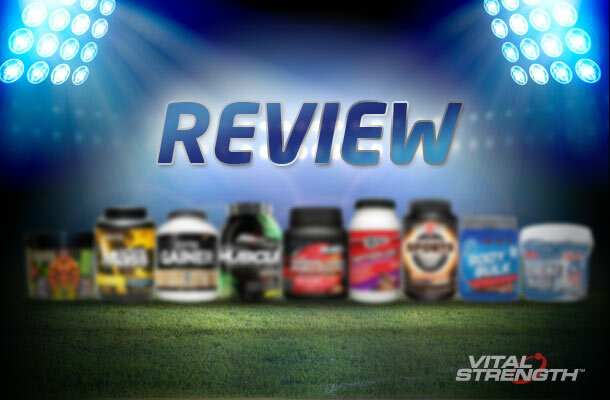 Read our brand comparison review for the best protein powder to get you ripped and lean fast.